This post is about a simple idea which I have often seen work well. It is about how, in situations in which got stuck, can often get unstuck by reframing the situation or the problem. Often, in situations in which we find ourselves stuck we limit our options by framing our situation too narrowly, in dualistic terms. For instance, I talked to a manager who was dissatisfied with something an employee had done. In the conversation he had about this topic with that employee he had ventilated his dissatisfaction and shown his irritation. The conversation did not go too well. The employee responded defensively and showed irritation too. He had even criticized the manager about his behavior. The manager asked what else he could have done, saying: "I am usually very appreciative but in this situation the employee performed unsatisfactorily, so there was no reason for appreciation. I needed to be firm!" 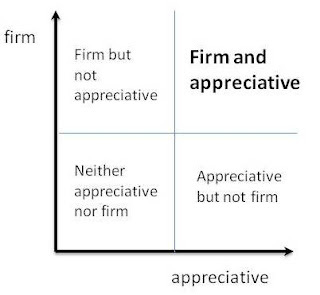 When the manager considered this he recognized that he could be firm without letting go his appreciativeness for the employee. While preparing the conversation with the employee he realized that he had much appreciation for the employee. He found a way to both show his appreciation for the employee and to be firm on the topic in question. When he had a second conservation he noticed that the employee showed more understanding and was willing to conform to the expectation of the manager. If you want to know how this simple reframing idea might be applied while using solution-focused scales, read this: The use of scaling question when there are multiple interrelated goals.